Medical scientists form one of the largest sectors of healthcare professionals worldwide, after doctors and nurses. There's an increasing demand for these highly trained personnel. They're the key people working behind the scenes performing diagnostic tests that help doctors diagnose diseases such as glandular fever, diabetes, influenza and even cancer. Medical scientists can also recommend treatment options and help manage clinical trials. Modern medicine is enhanced enormously by the insights into the human body that a wide range of high tech diagnostic tools provide. 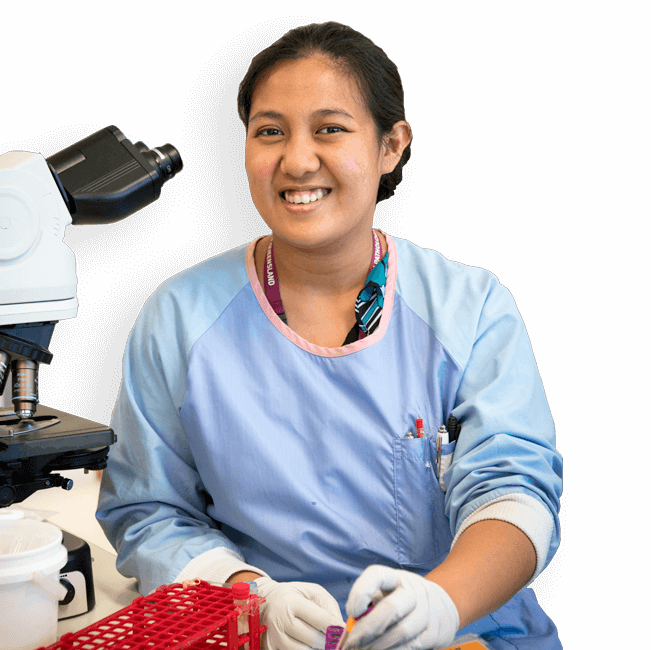 When you study for a Bachelor of Medical Laboratory Science at Griffith, you'll learn how every facet of healthcare is influenced by diagnostics — including pharmaceutical and technology development, patient management and more. This degree will prepare you to work with top biomedical companies in positions that will transform healthcare. You'll also be prepared for advancement and management positions within the field. You'll complete extensive laboratory work and clinical placement time, starting with 80 hours in Year 1 and growing to 400 hours, comprising your entire first semester in Year 4 and covering all areas of medical laboratory science and a research project. It's all highly hands-on. Technology will be integral to your learning, whether it's in our ultra-modern laboratory spaces or through 3D virtual reality simulation on mobile devices. You'll have the opportunity to undertake placements interstate or overseas in public hospitals, private clinics and veterinary labs. You'll be accredited in Australia with the Australian Institute of Medical Scientists and internationally through the UK's Institute of Biomedical Science, and be ready to enter the workforce as soon as you graduate. It's anticipated that future Griffith medical diagnostics graduates will be met with a similar demand for their services, due to the continuing growth of the healthcare sector and a shortage of highly-skilled medical scientists.